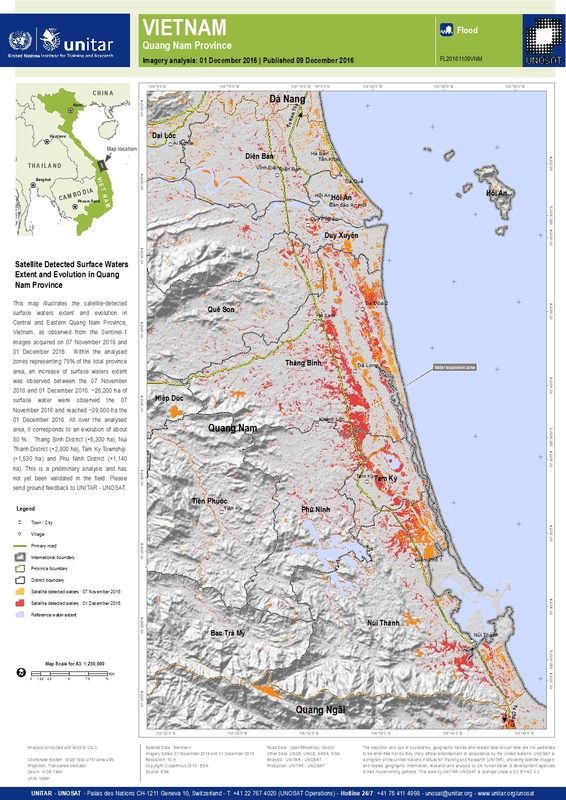 This map illustrates the satellite-detected surface waters extent and evolution in Central and Eastern Quang Nam Province, Vietnam, as observed from the Sentinel-1 images acquired on 07 November 2016 and 01 December 2016. Within the analysed zones representing 75% of the total province area, an increase of surface waters extent was observed between the 07 November 2016 and 01 December 2016. ~26,200 ha of surface water were observed the 07 November 2016 and reached ~39,000 ha the 01 December 2016. All over the analysed area, it corresponds to an evolution of about 50 % : Thang Binh District (+5,300 ha), Nui Thanh District (+2,800 ha), Tam Ky Township (+1,530 ha) and Phu Ninh District (+1,140 ha). This is a preliminary analysis and has not yet been validated in the field. Please send ground feedback to UNITAR - UNOSAT.